Paint Out Norwich 2017 saw over 200 works of art created by 37 artists, each in under 3 hours, across 3 days of Indian summer weather around the city. Wednesday night saw the Private View and Awards event packed out with a buzz around the unconventional yet contemporary, white-walled shelving, curated display of mostly unframed artworks. The judges on the night, all of whom have links to Norwich or Norfolk, were Marcus Dickey-Horley (Curator of Access and Public Programmes who has worked at a number of major London galleries), Hugh Pilkington (Cley16 curator), and artist John Wonnacott, who also delivered a fascinating art talk “Confronting Appearances” during the week long celebration of art and plein air competition. 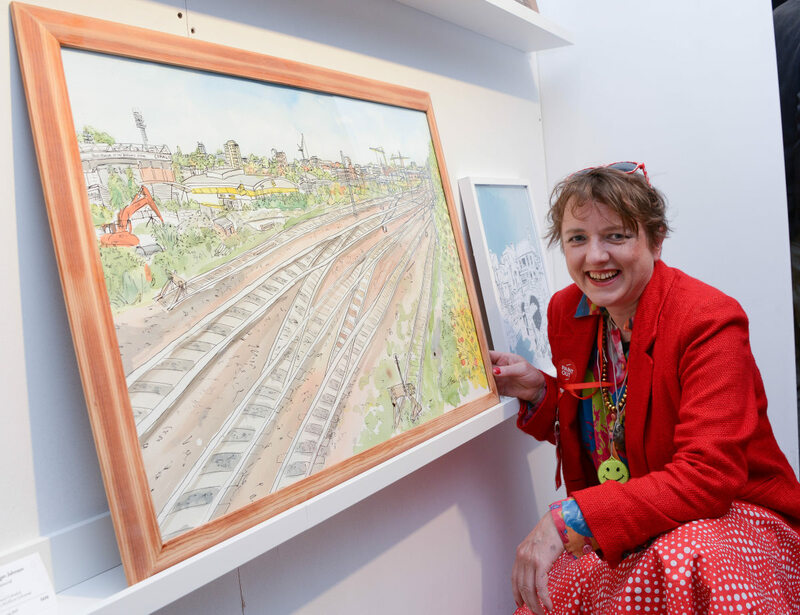 First Prize of £500, donated by Leathes Prior, went to Norwich resident Eloise O’Hare for her watercolour and ink large painting of Norwich Station’s railway tracks, “Keeping Track of Time”. Eloise previously won Third Prize in 2015. Last Saturday, she also painted the spectators walking past and arriving at the VIP Directors entrance of the Norwich City v Hull City football match, at which some fans were wearing vintage Colman’s shirts. Ed Balls and Delia Smith, among others, feature in the painting and Delia came over to see herself in the large format painting. It was also on show in the Cathedral Hostry 19-28 October, alongside the competition paintings. Oils – Emily Faludy of Peckham, London, “Morning Illumination” on Riverside. Emily only went full-time as an artist 4 months ago and was “shocked but said that “life should be one long painting trip”. Watercolour – Andrew Horrod, of Sutton in Surrey, “Five Past Four, Gunton Building”, painted outside NUA. Illustration & Printing – Beverley Coraldean, who studied at Norwich School of Art and Design, “Café Britannia ~ A Sunny October Afternoon”, from Mousehold Heath. Beverley uses “a combination of architectural perspective drawings, detailed cityscapes and hand-drawn type to explore [her] love for cities”. Nocturnes – Robert Nelmes, who also won the Royal Norfolk Show 2017 Paint Out, of Roydon near Diss, “Sasha Eating His Chips”, outside Grosvenor Fish Bar. 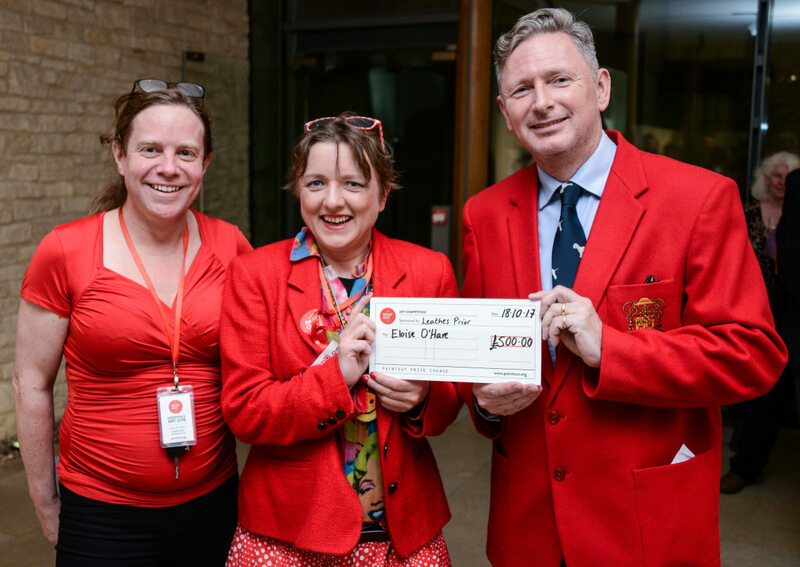 Further art material prizes were sponsored by Cass Art and Norwich Art Supplies including the judge’s commendations, above. The Spirit of Plein Air award once again went to Norfolk-based American artist John Behm for his watery endeavour, positioning himself in kilt and bare feet in the River Wensum to get the best angle of view to paint Bishop’s Bridge. A further prize, the Spirit of Norwich, was awarded to Alex Atkinson for his “Under the Elm” on Elm Hill. The artist, who lives in Norwich, clearly knows his city well. Paul Gadenne, who travelled up from Kent, as in past years, just to join in the public paint out, won the public entry prize for the Ketts Heights and Mousehold Heath event on Sunday, for his painting “Norwich Cathedral”. 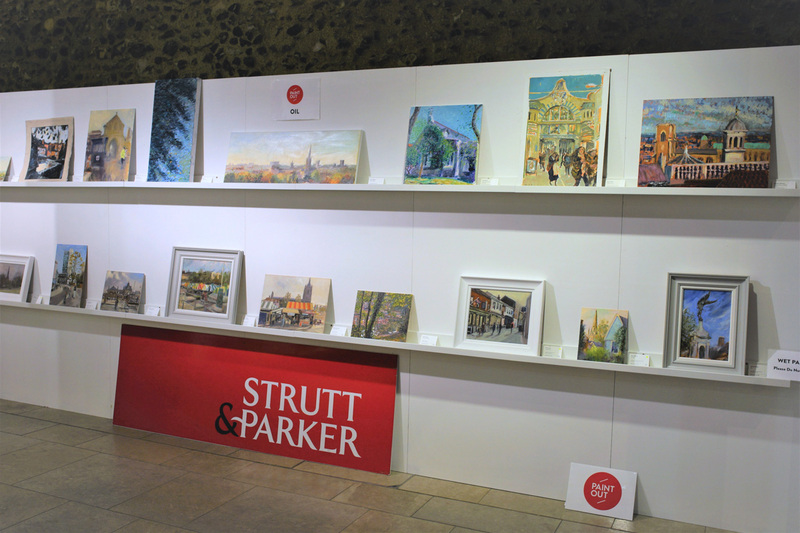 The paintings remained on view at the Norwich Cathedral Hostry as part of the Hostry Festival and Paint Out exhibition until 28 October. 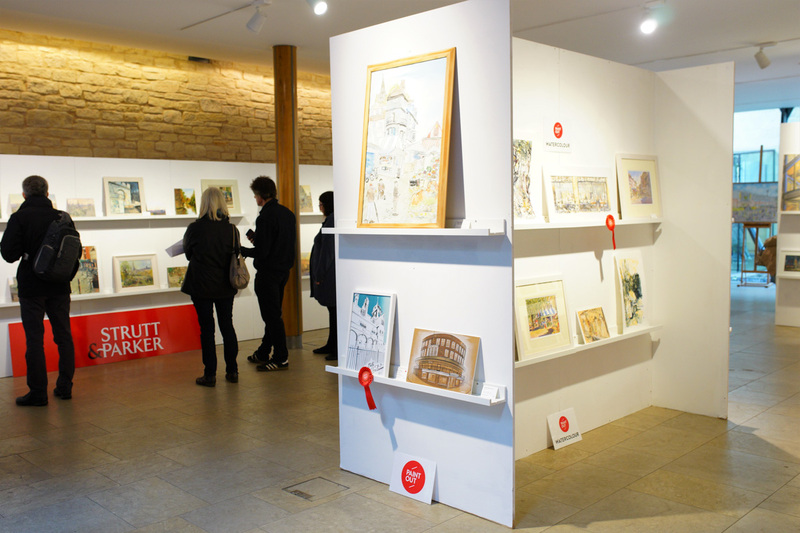 Over 8,000 people saw the 150+ paintings, with some 30 artworks selling. Exhibition visitors chose the pastel work of art “Red Beret” by artist John Patchett as their Public Vote Choice. 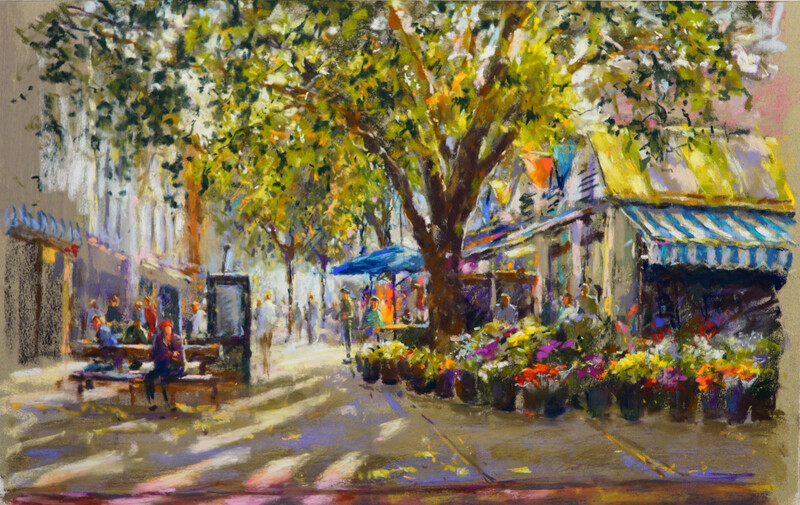 Artist John Patchett, ‘The Red Beret’, Norwich Market, Pastel, 50x32cm, £425 SOLDSee more of the paintings and artworks from the competition week in our online art gallery.